At United Soldiers and Sailors of America we aim to keep overhead costs at target of no more than 10%. No organization, nonprofit or not, can be successful without the organizational and administrative network and strength needed to accomplish the mission. This mean for every dollar received, 90 cents is directly spent on the programs, services, and items for veterans and their families. None of this would be accomplished without the generous support of our donors and their charitable contributions. Please consider making a one time donation or a monthly contribution to our mission. I can write a novel praising USASOA. They came to my sons aid after he was injured in Afghanistan. They reached out to my family and made sure we had everything we needed. They go the extra mile in assuring our military and vets are taken care of. They honored my son in a recent Gala held in DC. Im forever grateful for all they have done to assure my son is taken care of. 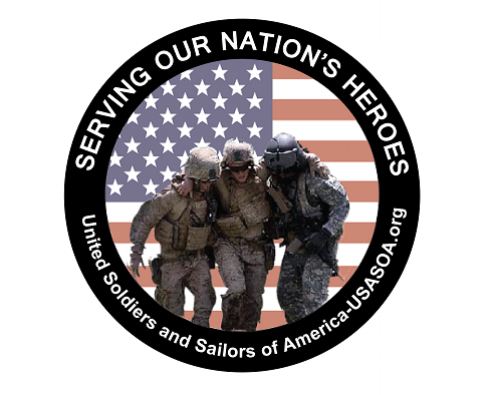 USASOA live and breathe to help our Injured Military, Veterans and their family. They are the REAL DEAL! No paychecks to these angels! They donate their time and energy to make life easier for those that need help. I'm forever grateful for the time they took to honor my son and his family. A lot of people talk about taking care of our wounded vets. Then there are people who go out and make it happen. United Soldiers and Sailors really engenders the sense of family that bonds service-members and veterans through their lives. They all volunteer their time and money, going out of their way to do whatever they possibly can to come to the aid of brothers and sisters left behind when government resources prove inadequate in taking care of veterans in need. If there is but one organization that demonstrates a steadfast commitment to the well-being of combat veterans this is that organization. When a vet is tangled in a web of government bureaucracy, when it seems there is no one to reach out to veterans can reach out to their comrades at USASOA. I'm very honored to do whatever I can to aid this group of unsung heroes in their mission to provide aid and comfort to veterans in need.